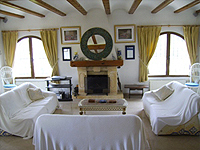 A large, light and spacious villa, surrounded by mature gardens and shrubs. The moment you enter the grounds you have the feeling of complete seclusion and privacy. One cannot fail to be enchanted with the large patio and kidney-shaped pool, with its arched, Andalucian-style walling adorned with bougainvilleas and other flowering shrubs. The main living area and three of the bedrooms and two bathrooms are on the same level as the patio and pool. The master bedroom has a king-size bed, en suite bathroom and doors to balcony with sea and coastal views. There is also one double bedroom, one twin-bedded room, and a fourth very large bedroom, on lower level, with double bed, two single beds and en suite shower room. Fans in each bedroom. There is 1 full bathroom en suite. 2 walk in shower rooms (1 en suite). 2 Bathrooms are suitable for disabled persons. The liviing room has very large, doors to the patio and pool and the dining area has seating for 10. Spacious, comfortable lounge area with fireplace. Dedicated TV area, Digital TV with good choice of English channels inc. BBC, ITV, sports & films. HiFi. DVD. Doors to balcony with sea and coastal views. The fully equipped kitchen includes oven, hob, dishwasher, fridge/freezer, microwave, washing machine and table/chairs. 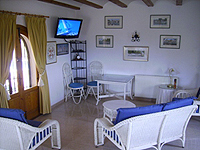 Outside the villa has a mature garden, walled patio, pool, BBQ. Dining table/chairs. Recliners. Parking. Central heating for the cooler months. Vlla is cleaned between lets. Weekly linen change and refresher clean. Hand/bath towels provided - please bring your swimming towels. There is a good supermarket in the vicinity, and other shops, bars and restaurants within a few minutes radius by car. About 3 km away is the Arenal beach, offering sand and sea, an extraordinarily bustling and lively atmosphere, nightlife for the young and the not so young, and a good choice of bars, restaurants and shops. The attractive port and historic old town of Javea are also well worth a visit, and two excellent golf courses are just a short drive away.